I’ve been lying to everyone and it’s time to make amends. You see, when asked about Christmas, I always tell folks I “don’t do” Christmas. And that’s true. I don’t celebrate the holiday in a traditional way. I don’t have family, so I don’t feel obligated to participate in any dreaded family get-togethers. I haven’t purchased a single gift nor have I mailed even one card. There are no candles in the window nor carols at the spinet. And I’ve lived this way for close to two decades. The transition happened gradually, shortly before I moved to California in 1998. My grandmother, who had been the anchor of many of our family traditions, passed away. My father picked up the reins and we started some new traditions without her. And then my father died. And then I moved to California. The first winter I lived here, I travelled home to upstate New York for the holiday. It was just me, my mother, and my sister (who also used to live in CA). My other sister had estranged herself from the family, and, as the mother of the only grandchildren in the family, she deprived us of sharing the experience with children. So we went from a two-day celebration filled with tons of family and friends to a depressing week where my mother didn’t get out of bed, my sister drank 2 bottles of wine each night, and I started to hate the holiday that I had always loved. Although my mother lived another five years after this, that was my last Christmas in New York. The following year, I started riding a bicycle. I hooked up with three other riders (all training for the California AIDS Ride) and we rode together for 4 days over the Christmas holiday. We called ourselves the “Christmas Orphans.” We each had a different story, but what we shared was the fact that we were alone for the holidays and that we all rode a bike. 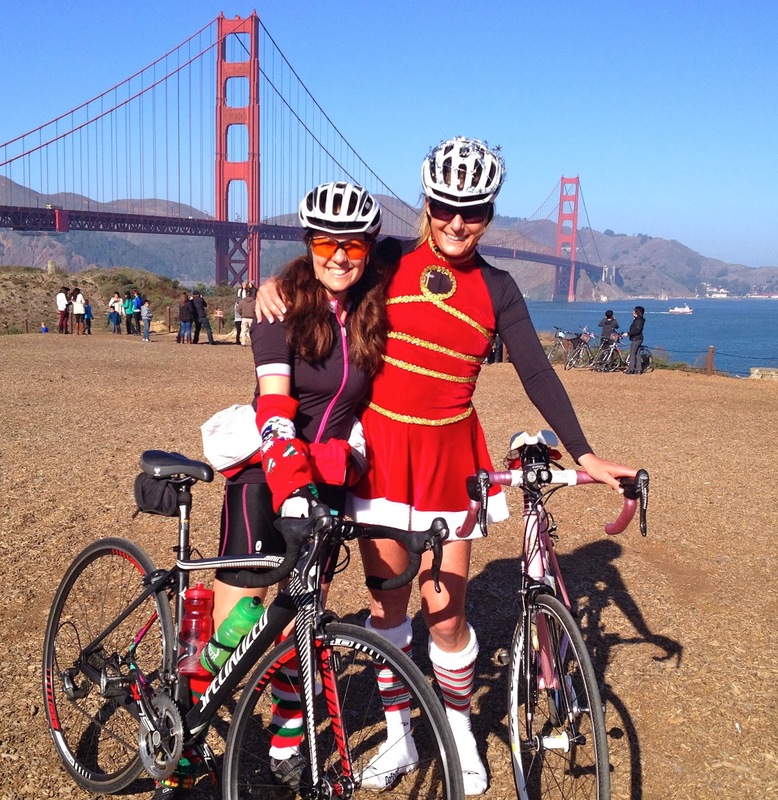 On Christmas morning 1999, we rode a 30-mile route in San Francisco. We continued to be friends and this ride became a holiday tradition. Over the years, the other three moved on to other traditions, I continued on, and today marked the 15th Annual Christmas Orphans’ Tour of San Francisco. In these 15 years, I’ve only missed twice: once when we cancelled due to torrential rain and wind and once when I was recovering from surgery. One year, there were only 2 of us on the ride (it was pouring rain). One year, there were close to 100 riders (thanks to a calendar listing from the San Francisco Bicycle Coalition. 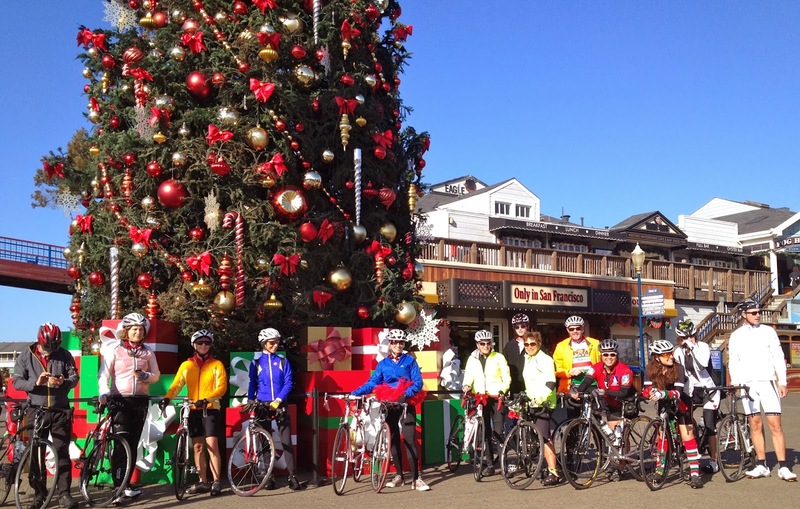 Everyone comes from a different place, many of them with connections to me, and they share the desire to participate in a fun, social ride on Christmas morning. And, no matter what size the group, we bring smiles to the faces of all who see us, dressed in Santa hats, elf costumes, and riding decorated bikes. The Christmas Orphans’ Tour of San Francisco is a unique ride. It’s not a long ride, totaling just 29 miles. It’s not a hard ride, with less than 1,500’ of climbing. It’s not a fast ride, since we keep the group together (no matter how slow the slowest rider is) and we stop to enjoy the view, take photos, and maybe even have a cup of hot chocolate. It’s a social ride where old friends and new friends get to see the city in a new way. On Christmas morning, when everyone else is sitting around their Christmas tree, you can see the random art in the city – the murals and mosaics, the sculpture and the architecture, and, on a clear day like today, the amazing views of the bay, the bridges, and the ocean. It’s been fascinating for me to see how our beautiful city has changed in the past 15 years. The infrastructure for bicycles has improved dramatically. The ballpark was built and has changed names a couple of times. Parts of the city have been developed while other parts have become less desirable. I’ve noticed more folks are out and about running, bicycling, surfing, and walking (and today’s beautiful weather definitely contributed to this). And I still see the homeless, the needy, and the hopeful on street corners and hidden in the nooks and crannies of the city. So, my reality is that I DO celebrate Christmas. And I DO give gifts. My gift is bringing together random strangers and friends to share in this amazing experience. I give folks who might be alone the opportunity to spend time with others. I give folks who don’t celebrate Christmas something to do on a day when many folks are busy with family. I give myself the opportunity to continue a tradition that has been very meaningful for me. And the other riders give me the opportunity to share this with them. It’s amazing to me that I’ve continued this tradition for 15 years. I don’t think I’ve ever done anything else in my entire life for 15 years. But then again, I’ve never loved anything or anyone the way I love my bike. And love is actually what traditions like Christmas are all about.